Even when we put a regular processor under 100% load, we're never fully utilizing 100% of the execution units. With a HyperThreading enabled processor those spare execution units can used towards computing other things now. As you saw from the previous slides from last years Intel Developer Forum, the single Superscalar processor is busy computing information however about half the processor remains unused. In the Multiprocessing portion of the demonstration we see a dual CPU system working on two separate threads, however again about 50% of both CPU's remain unutilized. In the lone HyperThreading enabled processor, both threads are simultaneously being computed and the CPU usage efficiency has gone up from around 50% to over 90%! The last example illustrated that dual HyperThreading enabled processors can naturally work on four independent threads at the same time. Again CPU efficiency is around 90%. While this sounds all very well and good, it's also about the most ideal situation ever so let's get back to the real world. In those examples there is a of overlapping when computing threads. For the execution units that have been "overlapped", twice as much work is required now, so the end result is not necessarily any faster than a regular superscalar processor that worked on the same information separately. If you were to run two pieces of software that are completely different, and use different execution units, your system performance should get a noticeable boost! 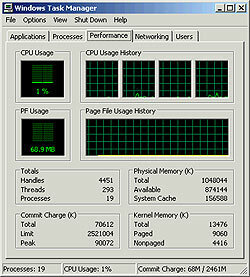 The operating system will also play a key role in how well HyperThreading works. The OS assigns operations to the independent logical processors, and so if it's determined that one of the logical CPU's is to remain idle, the OS will issue a HALT command to the free logical processor thus devoting all of the other system resources to the working logical processor. Please understand this is an extremely simplified explanation on how HyperThreading works. For more detailed information, you can read through these sections from from Intel's website: HyperThreading and Xeon processors , eBusiness Xeon and desktop HyperThreading .